Available services are listed here. 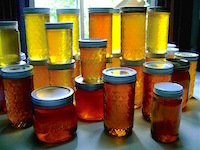 Bob Crouse - Local Honey - Dogwood Apiary - 410-638-0105 - Dogwood Lane just north of C. Milton Wright School on 543. Look for the HONEY sign. Ed Yoder - Local Honey - King Bee Apiary (Street, MD) Ed's honey can be purchased at Saubel's Market in Whiteford, Md. and also at Kleins Shop-Rite in Forest Hill and Bel Air. The SBA will match beekeepers with hives, with people who would like hives on their property. Please contact the SBA if you would like more information.